Weeds make asparagus harvest more difficult. Maintaining an asparagus field weed free during the two month harvest season requires a planned herbicide application prior to spear emergence. Choose a postemergence herbicide or tillage to control emerged weeds, and residual herbicides to control annual grasses, and annual broadleaf weeds during harvest. Control emerged winter annual weeds with a labeled glyphosate product, Gramoxone, or tillage. If a postemergence herbicide is used, allow at least 3 to 4 days for the herbicide to work before performing any tillage. Use Solicam or Devrinol for residual annual grass control plus Karmex for residual annual broadleaf weed control during the harvest season. Apply the Karmex plus half the total annual rate of Solicam or Devrinol. Residual herbicides can be tank-mixed with postemergence herbicides when asparagus is managed “no-till”. Apply immediately after ridging and BEFORE spears begin to emerge when the asparagus field is managed with tillage. The second half of the Solicam or Devrinol should be applied at the end of the cutting season with Sencor/Lexone. Solicam is more effective than Devrinol, but Solicam has a long carryover residue that can affect subsequent vegetable crops if the treated field is rotated out of asparagus. Devrinol is labeled in several vegetable crops. Use Devrinol if the field may not be maintained in asparagus production after harvest this year or next year. Add Callisto to improve control of annual broadleaf weeds. 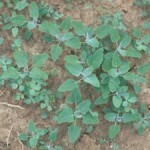 Callisto is very effective for the control of common lambsquarter, including triazine resistant common lambsquarter and horseweed (marestail or stickweed), including glyphosate resistant horseweed, and many other annual broadleaf weeds. Use the lower rate on coarse textured soils that are low in organic matter and the higher rate on fine textured soils and on soils with higher organic matter. A split application of half the maximum labeled rate applied in early spring, followed by a second application after harvest can be used to extend the length of weed control obtained and increase the margin of crop safety. Add NIS (nonionic surfactant) to be 0.25% of the spray solution or COC (crop oil concentrate) to be 1% of the spray solution if susceptible weeds have emerged. Consult the label for a complete list of weeds controlled. Consult the Commercial Production Recommendations for rates and additional information.